Does the market really set the price for your product? Do you have any control over price? How can you then succeed with a Gym that charges $500 per month when market decides the rate is $45 a month? For this we need to start with Segmentation and Product Positioning. Customers buy products get a job done. 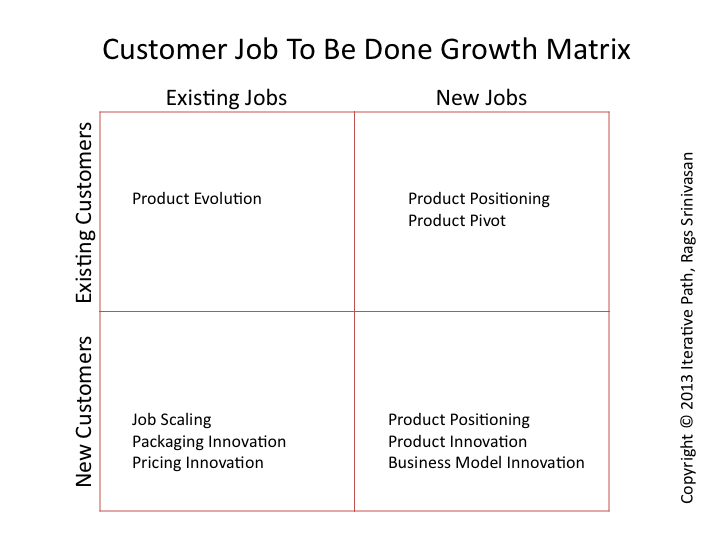 And the job to be done varies with customer segments and context. The term ‘job’ really represents the unmet need at hand. It covers both utilitarian as well as hedonistic (and hence needs and wants). It also makes sense to view this as ‘hire’ decision since they can either stick with what they already have or switch when they find better alternative. Positioning is creating a unique, relevant and differentiated positioning in the minds of the customers for your products. Product positioning is telling customers – specifically, targeted customer segment- what job you want them to hire the product for.
. From the jobs perspective it is telling them clearly which job you want them to hire for and why your product is the most suited candidate for that job. While your product could be hired for many jobs you want to go after those where you have sufficient differentiation and also pay well. Take the case of boutique gyms that charge close to $500 per month when you can sign up for most gyms for $30-$50 a month. In fact you can get an year worth of membership for less than one third of what you for a month at boutique gym. But customers are flocking to the boutique gyms, happily paying far more than what they used to pay (take that reference price). Market research says of the 54 million members of fitness facilities, 42% use boutique gyms paying premium prices. That number is nearly double of what it was the previous year. Take the more recent example of SoulCycle which filed its S1 for going public. It teaches riding stationary bikes set to music and charges $35 per class and had 2.8 million rides last year from just two states (38 locations). What happened to market deciding prices? How do you get customers to pay more for what they can get for free or cheap? It starts with segmentation and ends with product positioning. The target segment clearly has not only willingness to pay but also enough wherewithal to pay. The goal is not market share although that could come later. The goal is give the target customers an excuse to pay their premium prices, willingly. If fitness is the job to be done the candidates available for this job are very many. Most are free – just put one step in front of other and keep walking. In the organized fitness arena there are many chains that offer equipments and some training. So if you position your new product – the boutique gym – purely for fitness the price you can charge for it is determined by the price of alternatives available to the customer. As exercise routines serve more roles in people’s lives—stress relief, psychotherapy, social outlet, even personal identity—the expense of boutiques becomes easier to justify, their devotees say. Boutique-fitness fans also say they like the fact that most workouts are led by instructors or coaches. Some say they feel a sense of belonging that overrides the fact that they’re spending more for fewer disciplines than what’s available at a health club. If the job to be done is therapy or a social outlet the alternatives are prices are much higher price point than just gym membership. The visit to gym becomes more than aboring routing, it is an experience that creates sense of belonging. So the boutique gyms get to signal the higher price point and set a price just low enough below the alternatives to get customers to pay. SoulCycle isn’t in the business of changing bodies: it’s in the business of changing lives. What we create: A community for our riders. SoulCycle is a business built on relationships. It starts with our leadership and extends through our studio teams, instructors and corporate employees. We build our rider communities by developing relationships with our riders and encouraging them to develop relationships with each other every day. The concept of community and mutual support is reinforced in every single SoulCycle class. We ride to the rhythm of the music, moving on the bikes together as a pack. We are accountable to one another during class, and we celebrate our journey together when class comes to a close. We believe the SoulCycle experience fosters loyal communities of riders whose relationships extend well beyond the doors of our studios. If I ask you to pay $35 per class for teaching you how to pedal a stationary bike you most likely would laugh at me. If I offer you to build relationship, community and mutual support you will be more than willing to fork over that price. Market does set prices for alternatives. But you get to choose which alternatives you want to be compared against by positioning your product for the right customer job to be done. Final note of caution – whether the positioning is sustainable or not is not discussed here. We do not know how defensible is the current positioning of SoulCycle and their ilk. I will discuss the topic of sustainable positioning in coming weeks.